Yay! I’m finally able to make a post! I decided to take a breather from SL after the TMZ party. Event planning can be so overwhelming sometimes. And, of course, it’s good to have a RL/SL balance. poses by Haru – Asia *new*. photos taken at Halloween Town. The Pastel Goth Fair and Wayward Halloween both open this weekend! Pastel Goth on October 16th and Wayward Halloween on October 17th. There is a lot going on this weekend, including the 7th Annual TMZ Halloween Costume Party which you won’t want to miss! Check out the flyer below. It’s timeee!! I’m excited. 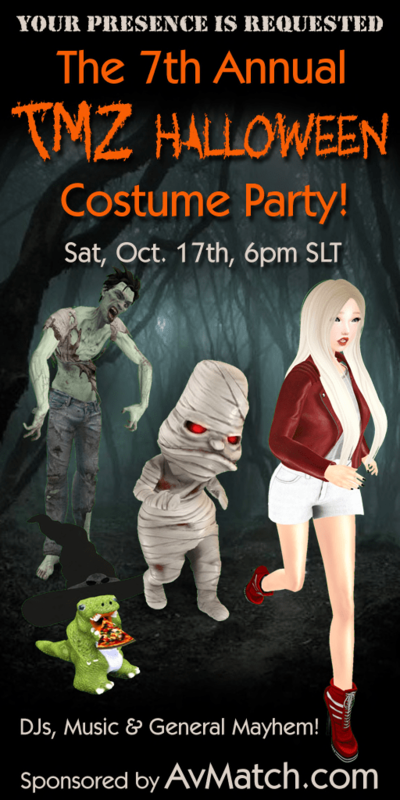 The party starts at 6pm SLT on Saturday the 17th and will be held at the special TMZ venue. I’ll be posting details and more information on Facebook and Flickr! Full details on my outfit below. poses by IDK – Pack 80 *new* and soon at The Pastel Goth Fair. photos taken at haunted sleepy hollow.